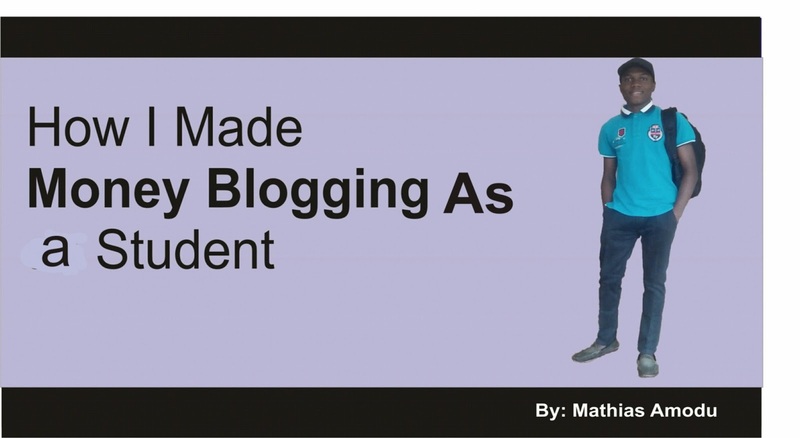 Blogging has been my major source of earning as a student over the years and it has really developed my sense of reasoning everywhere I go relating with people from different places around the world. But before I move further i will like to do some little introduction about myself before I unleash my secrete of earning in the blogging sphere. “My name is Mathias Amodu a student at Kogi State University Ayingba (200 Level Faculty of Agriculture in The Department of Crop Production) also an Igala by tribe and raised up as Christian here in Nigeria”. First my interest having a great achievement towards my online activities was not that easy when I failed jamb my first year in 2014 after my SSCE exam but before then I had this spirit [just try it and see] so I pushed on to peperonity.com which I created www.atinga10.peperonity.com but still I was not satisfied with it so i decided to go on a research so during the research I landed at www.andriodvillaz.net were i needed some free or cheap browsing cheat and a thought came to my mind which was “ why don’t i create something similar to this so that people will also come and get solution” so i decided to scroll down until i saw a link powered by blogger so I decided to save the page because blogger does not support java so I needed to use a computer, so that was how my story as a blogger began in the year 2014/2015. During this period when I was about creating a platform for myself I was a little bit confused on which niche to go into and my monthly subscription as a student and also time for school activities although it was not easy this period because I needed to choose the right niche and also having different thought on how to get money for subscription and also time.